The models on this page are all stellations of uniform polyhedra or their duals. There are literally trillions of possible stellations, so these are just a few! These models were made using nets generated by Great Stella, but could also be made using Stella4D. Click on the images below to see a bigger picture and get more information about how they were built. Below is a set of seven stellations of the pentagonal icositetrahedron, dual of the snub cube. I have numbered them arbitrarily from 1 to 7. It's interesting to see that 1 and 2 are so similar. 7 is the same as 6 with one extra stellation cell included. 5 and 6 are kind of cubic and octahedral versions of the same idea. By stellating the pentagonal hexecontahedron, dual of the snub dodecahedron, you could also create dodecahedral and icosahedral variants on this same idea. What about a tetrahedral version? Yes, that would be a sub-symmetric stellation of the dodecahedron, dual of the icosahedron, which may be thought of as a snub tetrahedron. 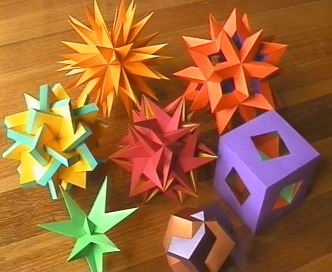 Stellations of this model originally appeared in the paper Symmetry and Polyhedral Stellation by G. M. Fleurent (Computers Math. Applic. Vol. 17, No. 1-3, pp. 167-193, 1989). Two of my seven models, 3 and 7, did not appear in that paper. Of course, using Great Stella, you no longer need to understand or perform any complicated maths in order to make the models. Click on the images below to see a bigger picture and for more info, including stellation diagrams for each one. The (small or great) dodecahemicosahedron has some amazing stellations. The small dodecahemicosahedron and great dodecahemicosahedron have the same facial planes, so these stellations may be thought of as stellations of either model. There are 12 dodecahedral planes, and 10 icosahedral planes which pass through the very centre of the model. The golden ratio is prevalent in these stellations. I don't know of anyone having studied stellations of this model before (although someone probably has). I have made three of these stellations. Click on the images below to see a bigger picture and get more details about each one, including views down each axis of symmetry. Here are some others that I haven't made, but which deserve a mention. These have been exported from Great Stella for rendering in POV-Ray. "The Ace" "Suckers" "Golden Checkers"